Pediatric femoral fractures may involve the proximal femur, the femoral shaft, or the distal femur. In the treatment of these injuries, it is important to keep in mind that pediatric femoral fractures differ from adult femoral fractures in several key respects (see below), and these differences affect management. The embryonic development of the femur begins during week 4 of gestation, with the appearance of the limb bud. Rapid mesenchymal growth follows, and the endochondral ossification occurs during week 8. The femoral shaft is the primary ossification center. Secondary ossification, at the upper end, begins at the gestational age of 6 months. Ossification of the femoral head occurs at the age of 4-5 months. The distal femoral ossification center appears during month 7 of gestation. At about 4 years of age, the single secondary ossification center at the upper end divides into two separate structures: the greater trochanter and the capital femoral epiphysis. The lesser trochanteric apophysis ossifies at the age of 10 years. The proximal femur has two growth centers: the proximal femoral epiphysis and the trochanteric apophysis. The proximal femoral epiphysis contributes 30% of the length of the femur and 13% of the length of the lower limb. Damage to the proximal femoral epiphysis leads to shortening of the extremity. The trochanteric apophysis is a traction apophysis, and it contributes to the growth of the femoral neck. Injury to the trochanteric apophysis or paralysis of the muscles attached to it leads to shortening of the greater trochanter and coxa valga. Overgrowth of the greater trochanteric apophysis leads to apparent coxa vara and reduced articulotrochanteric distance. Proximal femoral bone is very strong and is not easily fractured, except when the bone is affected by a pathologic condition. The proximal femoral epiphysis, however, is an area of structural weakness that can fail readily when subjected to shear forces. 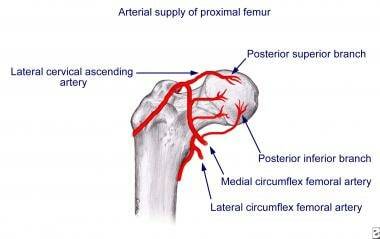 The vascular anatomy of the proximal femur in children differs from that in adults. The artery of the ligamentum teres does not contribute any blood supply until the age of 8 years. The metaphyseal vessels do not contribute to the vascularity of the femoral head after the age of 3 years, and they contribute to the intraosseous blood supply to the femoral head only after the physeal closure, between the ages of 14 and 17 years, when the vascular anastomoses between the metaphyseal and epiphyseal blood vessels develop. Arterial supply to head of femur in child. The longitudinal growth and peripheral growth of the femoral shaft occur by endochondral ossification, which leads to the formation of woven bone. With maturation and development, the bone becomes more like adult bone, with remodeling of the trabecular bone into lamellar bone along the lines of stress. The pediatric femoral shaft has an abundant blood supply that derives from both endosteal and periosteal blood vessels. The endosteal blood supply is from two nutrient vessels, which enter the medullary canal posteromedially at the junction of the proximal and middle thirds and the junction of the distal and middle thirds of the shaft. The periosteal blood supply comes from the large muscular cuff of the thigh. The periosteal vessels supply the outer one third of the cortex. These two systems are interconnected and together provide the abundant blood supply that facilitates both the growth of bone and the healing of fractures in children. The epiphyseal ossification center of the distal femur is usually present at birth in a full-term infant. This area is the largest and most active physeal system in the body, contributing almost 70% of the length of the femur and 40% of the length of the entire leg. It fuses with the metaphysis during the teen years (ages 14-16 years in girls and ages 16-18 years in boys). At birth, the physis is essentially a transverse plane. As the infant commences walking, shearing forces across the knee cause the development of macroscopic undulations in the distal femoral physis; the physis also exhibits microscopic undulations and mammillary processes. This is a very important point: Because of the undulating nature of the distal femoral epiphysis, any type of fracture may lead to growth problems. The physis is completely extra-articular. The strong posterior capsule and the major ligaments are attached to the epiphysis. Normally, in an adult knee, ligaments fail when a bending stress is applied across the knee. In an immature skeleton, the bone fails through the growth plate because the ligaments are stronger than the cartilage of the distal femoral physis. Nearly two thirds of femoral fractures in children and adolescents result from falls and motor vehicle accidents. Nearly 30% of fractures in children younger than 4 years are reported to be due to child abuse. Birth trauma can cause fracture of the femur in the newborn. Proximal femoral injuries are produced by high-velocity trauma, such as occurs with falls from a height, motor vehicle accidents, and child abuse. In cases of distal femoral fracture, the cause in younger children is invariably severe trauma, whereas the usual cause in adolescents is a sports injury. Various classification systems have been developed for proximal femoral fractures, femoral shaft fractures, and distal femoral epiphyseal fractures. 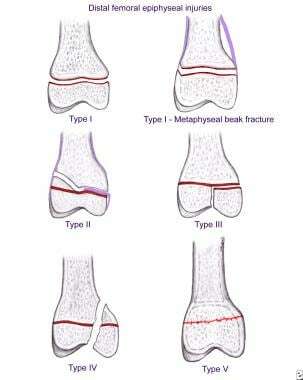 Depiction of various Delbet types of proximal femoral injury. Delbet type I injury is transepiphyseal separation—that is, acute traumatic separation of the proximal femoral epiphysis, similar to Salter-Harris type I epiphyseal injury. It is an uncommon injury, accounting for fewer than 10% of all pediatric proximal femoral fractures. This injury can occur in newborns after breech delivery and is often missed in these cases. Type I injury has also been reported in children aged 5-10 years. In these patients, it occurs after high-energy trauma and has a high incidence of associated injuries, especially femoral head dislocations. This fracture type has the worst prognosis, and the reported rates of avascular necrosis range from 20% to 100%. Delbet type II injury is a transcervical fracture and is the most common type, accounting for about 40-50% of proximal femoral fractures. These injuries are often displaced at the time of presentation. Avascular necrosis rates as high as 50% have been reported with these injuries. Delbet type III injury is a cervicotrochanteric fracture that occurs through the basicervical region; it accounts for 30-35% of proximal femoral fractures. Avascular necrosis (AVN) has been reported in 15-20% of cases. Delbet type IV injury is a pertrochanteric or intertrochanteric fracture. This type accounts for 10-20% of proximal femoral fractures and is associated with the best prognosis; avascular necrosis is reported in fewer than 10% of cases. The involvement of the greater trochanter may lead to premature closure of the apophysis and coxa valga. Distal femoral epiphyseal fractures are categorized according to the Salter-Harris classification of epiphyseal injuries, with a modification by Ogden (see the image below). 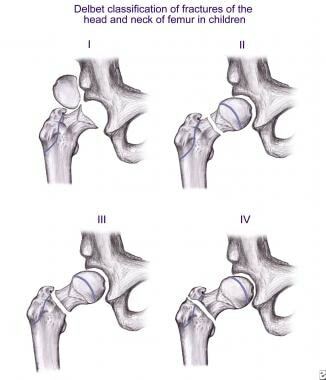 Depiction of various Salter-Harris types of distal femoral epiphyseal injury. Salter-Harris type I fracture involves the physis without an associated fracture through the adjacent epiphysis or metaphysis. It is an infrequent birth injury that occurs during delivery of a breech child, even in cases of cesarean section. The distal femur is also a common site of fracture in cases of child abuse. Metaphyseal beak fracture, a type I injury, is characteristic of child abuse but is not pathognomonic. Salter-Harris type II fracture is characterized by physeal fracture, with extension of the fracture line into a corner of the adjacent metaphysis. This is the most common fracture and occurs in adolescents. The metaphyseal fragment remaining attached to the epiphysis is called the Thurstan Holland fragment. The periosteum is intact on the compression/concave side, and the torn periosteal sleeve on the tension side sometimes becomes interposed between the fracture ends. Salter-Harris type III fracture involves the medial or lateral condyle. The fracture line usually exits through the intercondylar notch. Salter-Harris type IV fracture is uncommon. A sagittal fracture line extends from the metaphyseal cortex down to the physis and enters the articular surface of the epiphysis. Salter-Harris type V fracture is due to compression of the epiphyseal plate, which may be associated with an ipsilateral femoral fracture. Diagnosis is often retrospective when growth arrest is seen. Salter-Harris type VI fracture is caused by glancing blows that lead to destruction of a small peripheral segment and formation of a physeal bridge. Salter-Harris type VIII fracture mainly consists of a metaphyseal fracture with extension into the metaphyseal-physeal junction. Femoral head and neck fractures in children are rare injuries, accounting for fewer than 1% of all pediatric fractures and fewer than 1% of all hip fractures. Femoral shaft fractures account for 1-2% of all pediatric fractures. Fractures of the femur have a bimodal age distribution. There is a high incidence in the first 2-3 years of life, when child abuse most commonly occurs and the femur is composed of weak woven bone. After the age of 5 years, the increase in lamellar bone, the greater cortical thickness, and the larger femoral diameter result in a stronger femur, and the incidence of femoral fractures falls. A second peak in incidence occurs in adolescence, when motor vehicle accidents account for the majority of fractures. Ciarallo L, Fleisher G. Femoral fractures: are children at risk for significant blood loss?. Pediatr Emerg Care. 1996 Oct. 12(5):343-6. [Medline]. Hedequist D, Starr AJ, Wilson P, Walker J. Early versus delayed stabilization of pediatric femur fractures: analysis of 387 patients. J Orthop Trauma. 1999 Sep-Oct. 13(7):490-3. [Medline]. Guerado E, Caso E. The physiopathology of avascular necrosis of the femoral head: an update. Injury. 2016 Dec. 47 Suppl 6:S16-S26. [Medline]. Lang CJ, Ogden JA. Palmar (displaced) fracture of the proximal index metacarpal. J Orthop Trauma. 1999 Feb. 13(2):149-50. [Medline]. Loder RT, O'Donnell PW, Feinberg JR. Epidemiology and mechanisms of femur fractures in children. J Pediatr Orthop. 2006 Sep-Oct. 26(5):561-6. [Medline]. Trejo P, Fassier F, Glorieux FH, Rauch F. Diaphyseal Femur Fractures in Osteogenesis Imperfecta: Characteristics and Relationship With Bisphosphonate Treatment. J Bone Miner Res. 2017 May. 32 (5):1034-1039. [Medline]. Moon ES, Mehlman CT. Risk factors for avascular necrosis after femoral neck fractures in children: 25 Cincinnati cases and meta-analysis of 360 cases. J Orthop Trauma. 2006 May. 20(5):323-9. [Medline]. Gustilo RB, Anderson JT. Prevention of infection in the treatment of one thousand and twenty-five open fractures of long bones: retrospective and prospective analyses. J Bone Joint Surg Am. 1976 Jun. 58(4):453-8. [Medline]. Herman MJ, Smith BG. Fractures of the distal femoral physis. Flynn JM, Skaggs DL, Waters PM, eds. Rockwood and Wilkins' Fractures in Children. 8th ed. Philadelphia: Wolters Kluwer; 2015. 1027-56. Peterson HA, Madhok R, Benson JT, Ilstrup DM, Melton LJ 3rd. Physeal fractures: Part 1. Epidemiology in Olmsted County, Minnesota, 1979-1988. J Pediatr Orthop. 1994 Jul-Aug. 14(4):423-30. [Medline]. Heinrich SO, Finney T, Ambrosia RD. Bony injuries of the knee. MacEven GD, Kasser JR, Heinrich SD, eds. Pediatric Fractures: A Practical Approach to Assessment and Treatment. Baltimore: Williams & Wilkins; 1993. Rang M. Children's Fractures. Philadelphia: JB Lippincott; 1974. Lindseth RE, Rosene HA Jr. Traumatic separation of the upper femoral epiphysis in a new born infant. J Bone Joint Surg Am. 1971 Dec. 53(8):1641-4. [Medline]. Ng GP, Cole WG. Effect of early hip decompression on the frequency of avascular necrosis in children with fractures of the neck of the femur. Injury. 1996 Jul. 27(6):419-21. [Medline]. Song KS, Kim YS, Sohn SW, Ogden JA. Arthrotomy and open reduction of the displaced fracture of the femoral neck in children. J Pediatr Orthop B. 2001 Jul. 10(3):205-10. [Medline]. John R, Sharma S, Raj GN, Singh J, C V, Rhh A, et al. Current Concepts in Paediatric Femoral Shaft Fractures. Open Orthop J. 2017. 11:353-368. [Medline]. [Full Text]. Greene WB. Displaced fractures of the femoral shaft in children. Unique features and therapeutic options. Clin Orthop Relat Res. 1998 Aug. 86-96. [Medline]. Thompson JD, Buehler KC, Sponseller PD, Gray DW, Black BE, Buckley SL, et al. Shortening in femoral shaft fractures in children treated with spica cast. Clin Orthop Relat Res. 1997 May. 74-8. [Medline]. Buehler KC, Thompson JD, Sponseller PD, Black BE, Buckley SL, Griffin PP. A prospective study of early spica casting outcomes in the treatment of femoral shaft fractures in children. J Pediatr Orthop. 1995 Jan-Feb. 15(1):30-5. [Medline]. [Guideline] Kocher MS, Sink EL, Blasier RD, Luhmann SJ, Mehlman CT, Scher DM, et al. American Academy of Orthopaedic Surgeons clinical practice guideline on treatment of pediatric diaphyseal femur fracture. J Bone Joint Surg Am. 2010 Jul 21. 92 (8):1790-2. [Medline]. Anglen JO, Choi L. Treatment options in pediatric femoral shaft fractures. J Orthop Trauma. 2005 Nov-Dec. 19(10):724-33. [Medline]. Infante AF Jr, Albert MC, Jennings WB, Lehner JT. Immediate hip spica casting for femur fractures in pediatric patients. A review of 175 patients. Clin Orthop Relat Res. 2000 Jul. 106-12. [Medline]. Epps HR, Molenaar E, O'connor DP. Immediate single-leg spica cast for pediatric femoral diaphysis fractures. J Pediatr Orthop. 2006 Jul-Aug. 26(4):491-6. [Medline]. McCarthy RE. A method for early spica cast application in treatment of pediatric femoral shaft fractures. J Pediatr Orthop. 1986 Jan-Feb. 6(1):89-91. [Medline]. Martinez AG, Carroll NC, Sarwark JF, Dias LS, Kelikian AS, Sisson GA Jr. Femoral shaft fractures in children treated with early spica cast. J Pediatr Orthop. 1991 Nov-Dec. 11(6):712-6. [Medline]. Gregory P, Pevny T, Teague D. Early complications with external fixation of pediatric femoral shaft fractures. J Orthop Trauma. 1996. 10(3):191-8. [Medline]. Kanlic EM, Anglen JO, Smith DG, Morgan SJ, Pesántez RF. Advantages of submuscular bridge plating for complex pediatric femur fractures. Clin Orthop Relat Res. 2004 Sep. 244-51. [Medline]. Sink EL, Hedequist D, Morgan SJ, Hresko T. Results and technique of unstable pediatric femoral fractures treated with submuscular bridge plating. J Pediatr Orthop. 2006 Mar-Apr. 26(2):177-81. [Medline]. Sanders JO, Browne RH, Mooney JF, Raney EM, Horn BD, Anderson DJ, et al. Treatment of femoral fractures in children by pediatric orthopedists: results of a 1998 survey. J Pediatr Orthop. 2001 Jul-Aug. 21(4):436-41. [Medline]. Ligier JN, Metaizeau JP, Prévot J, Lascombes P. Elastic stable intramedullary nailing of femoral shaft fractures in children. J Bone Joint Surg Br. 1988 Jan. 70(1):74-7. [Medline]. Salem KH, Lindemann I, Keppler P. Flexible intramedullary nailing in pediatric lower limb fractures. J Pediatr Orthop. 2006 Jul-Aug. 26(4):505-9. [Medline]. Lascombes P, Haumont T, Journeau P. Use and abuse of flexible intramedullary nailing in children and adolescents. J Pediatr Orthop. 2006 Nov-Dec. 26(6):827-34. [Medline]. Mohamed A, Rajeev AS. Clinical outcomes and complications of titanium versus stainless steel elastic nail in management of paediatric femoral fractures-a systematic review. Eur J Orthop Surg Traumatol. 2017 Feb. 27 (2):157-167. [Medline]. Spence D, DiMauro JP, Miller PE, Glotzbecker MP, Hedequist DJ, Shore BJ. Osteonecrosis After Femoral Neck Fractures in Children and Adolescents: Analysis of Risk Factors. J Pediatr Orthop. 2016 Mar. 36 (2):111-6. [Medline]. Ratliff AH. Fractures of the neck of the femur in children. J Bone Joint Surg Br. 1962 Aug. 44-B:528-42. [Medline]. Elgeidi A, El-Negery A. Fibular strut graft for nonunited femoral neck fractures in children. J Child Orthop. 2017. 11 (1):28-35. [Medline]. [Full Text]. Zeckey C, Monsell F, Jackson M, Mommsen P, Citak M, Krettek C, et al. Femoral malrotation after surgical treatment of femoral shaft fractures in children: a retrospective CT-based analysis. Eur J Orthop Surg Traumatol. 2017 May 25. [Medline]. Eid AM, Hafez MA. Traumatic injuries of the distal femoral physis. Retrospective study on 151 cases. Injury. 2002 Apr. 33(3):251-5. [Medline]. McCartney D, Hinton A, Heinrich SD. Operative stabilization of pediatric femur fractures. Orthop Clin North Am. 1994 Oct. 25(4):635-50. [Medline]. Kasser JR. Physeal bar resections after growth arrest about the knee. Clin Orthop Relat Res. 1990 Jun. 68-74. [Medline]. Beaty JH, Kumar A. Fractures about the knee in children. J Bone Joint Surg Am. 1994 Dec. 76(12):1870-80. [Medline]. Patterns of avascular necrosis in hip fractures in children. (a) Delbet type I proximal femoral epiphyseal injury. (b) Reduction and fixation with smooth pins. (c) Avascular necrosis 1 year after surgery. (d) Bone scan showing decreased vascularity of femoral head on affected side. (e) Radiograph after pin removal showing avascular necrosis (L) of hip. Spiral fracture of femoral shaft, with hypertrophic callus due to previous multiple fractures (a) in 2-year-old abused child treated with spica cast (b), showing union (c). (a) Comminuted fracture shaft of femur in adolescent. (b) Insertion of submuscular bridge plate through small distal incision. (c) Screw insertion through tiny stab incisions under imaging guidance. (d) Postoperative check film. (e) Tiny scars 3 months after surgery. Type II distal femoral epiphyseal injury fixed with 2 smooth crossed pins. Schematic diagram showing various methods of operative fixation of distal femoral epiphyseal injuries. X-ray of adolescent who sustained sporting injury and fractured his right femur. Image courtesy of Dr. Bhavuk Garg, Senior Resident of Orthopedics, All India Institute of Medical Sciences, Delhi. Immediate postoperative x-ray of titanium elastic nailing performed on male child. Image courtesy of Dr. Bhavuk Garg, Senior Resident of Orthopedics, All India Institute of Medical Sciences, Delhi.